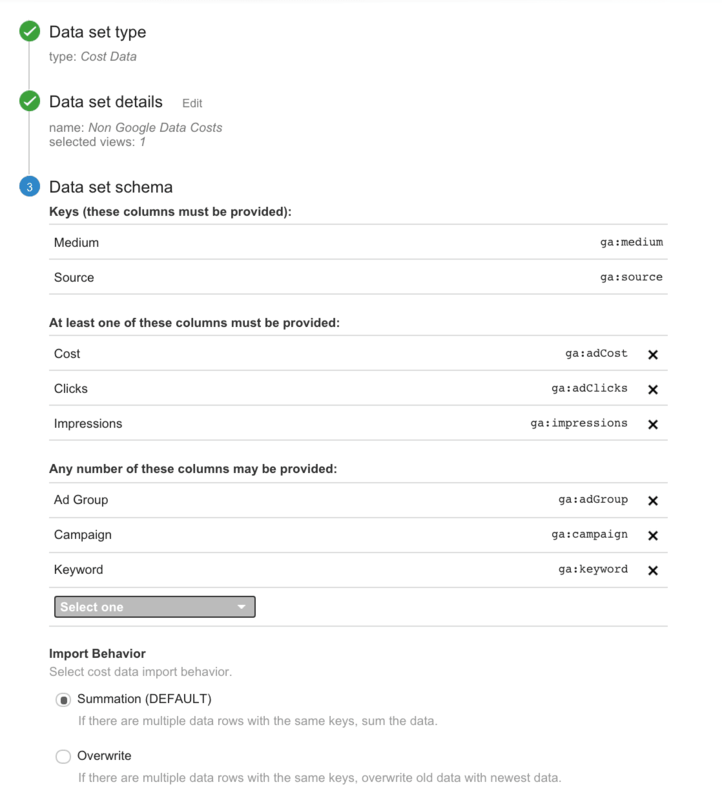 Data import is a feature of Google Analytics. It can be used to import a number of types of data. The aim of this blog is to enable you to import non Google advertising costs into GA. Remember you can only add to existing “hits” (visits and actions) with data import. There has to be a visit in GA for you to associate the cost/click/impression data to. What can I import with Cost data import? At least one of these must be imported. Other dimensions include Campaign, Ad Group, and Keyword. These allow for more granular data. To use data import you will need to use UTM parameters for any non Google . Ensure you use UTM down to the level you wish to upload costs for (if you want to add cost by campaign you need to use utm_campaign). *Important note: Uploads can be deleted, so they’re generally low risk. However, if you select overwrite rather than summation, any data overwritten cannot be replaced. 1. Download the data required for your data set. Go to the relevant platform and export the data, or use supermetrics. If you are using a previous file as a template you may want to change the date format before copying across to avoid the date being changed. Check: Do you need to delete previous uploads? It is possible to delete uploads, however to reduce upload size naming conventions for files to incorporate dates included (without the original file uploaded there is no way to download or see what it contained). This process deletes previous uploads and replaces with a new upload. Create a template file for the data. Each time an upload is made this file is used. Data can be added to or replaced* with data from the media platform. Follow above process, but in step 3 delete the previous upload before importing a new one. * Reasons to replace include some platforms “cleaning” data, more relevant if data is downloaded with low latency (i.e. if you download data from yesterday it is more likely to be revised than data downloaded 30 days after). Click and cost revisions tend to be extremely low. In this process naming convention is vital. The following file updated to start from when the last file ended, without overlap or gap.